Howard Wright Limited manufacture a complete range of high quality patient care products using the latest electronic componentry. Each product has been developed the same way, by firstly talking to the clinicians in hospitals and then converting their ideas into practical cost-effective designs whilst maximising patient comfort and minimising the risk of staff injuries. 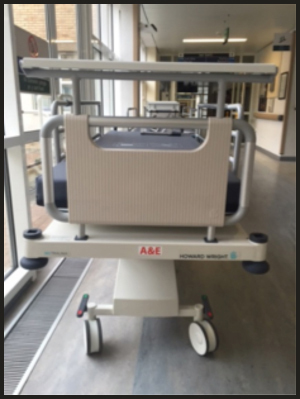 A number of new electric profiling trolleys had just been delivered in the emergency department of the local hospital. On delivery the hospital requested some labels to identify the department where the trolleys were to be utilised. The trolleys were ready to be used immediately but needed the labels applied before that could happen. It was a simple case of producing the labels very quickly. Customer comment – Jeff and his team at Reel Label Solutions were able to help us out with an efficient, practical solution to a last minute request by the hospital. We were really impressed by their service and would be more than happy to recommend Reel Label for any label work.